Botanical Name of Shepherd’s Purse: Capsella bursa-pastoris. Other Common Names: Lady’s purse, shepherd’s bag, mother’s heart, shovelweed, caseweed, borsa de pastor (Spanish), bouse de pasteur (French), Hirtentäschelkraut (German), hjartarfi (Icelandic), hyrdetaske (Danish). Habitat: The plant is probably native to Europe and parts of Asia, but now it can be found in temperate regions around the world. The European settlers brought the plant with them to North America, and the species quickly spread across the continent. 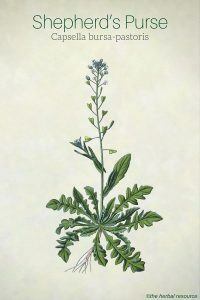 Shepherd’s purse is often regarded as a weed. Plant Description: Shepherd’s purse is an annual plant that belongs to the mustard family (Brassicaceae) with highly variable appearance. The plant is normally 10-50 cm high. The lower leaves are petioled, deeply lobed and sit in a rosette at the base. The upper leaves are irregularly toothed and clasping. The plant blooms from May and throughout the summer. The flowers are white and appear in clusters at the top of a flower stalk. The flowers are only about 2mm across. 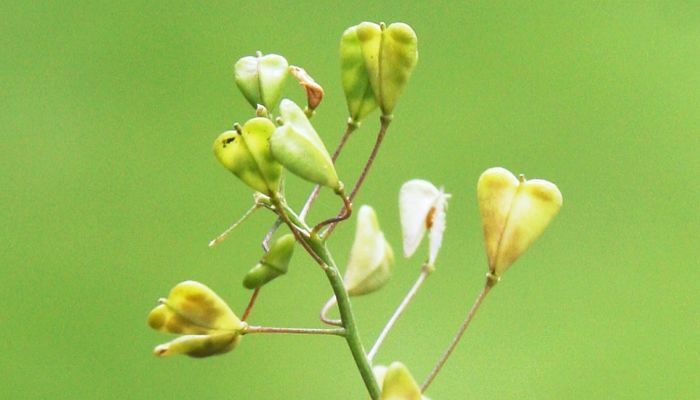 The seeds are contained in small pods or silicles that are triangular in shape and resemble purses once used by shepherds, hence the English common name shepherd’s purse. Plant Parts Used: All of the above-ground parts of the plant are used in herbal medicine. It is collected when it is in bloom and can be dried for later use. The herb has a somewhat unpleasant smell and a slightly bitter taste. 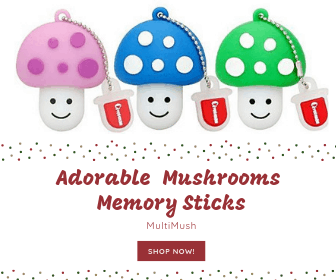 Active Ingredient and Substances: Shepherd’s purse contains flavonoids (quercetin, diosmetin, luteolin, hesperidin), glycosides, various amines (acetylcholine, choline, histamine, tyramine), volatile oil (especially camphor), carotenoids, fumaric, sinigrin (glucosinolate), and vitamins A, B, C and K.
The herb’s medicinal properties are probably not due to any particular substance but to the interaction between them. Shepherd’s purse has been used as a medicinal herb since ancient times and mention of it as an astringent agent can be found in many medieval medical books. During World War I, it was used by soldiers to stop bleeding when other means were not available and inventories of conventional medicine had run out. Pedanius Dioscorides (1st century AD) and Pliny the Elder (23-79 AD) describe the seeds of shepherd’s purse as an important laxative and an aphrodisiac. Today, the herb is often recommended as a treatment for both internal and external bleeding. Internally, it is especially used for menstrual periods with abnormally heavy or prolonged bleeding (Menorrhagia), bleeding after childbirth and when there is blood present in urine, stool, and vomit. Externally, the herb has been used to speed up the healing of minor wounds, cuts and scrapes and as an herbal remedy for varicose veins and hemorrhoids. Some herbalists have also recommended shepherd’s purse as a natural treatment of cystitis, diarrhea, and ailments of the digestive system. The herb’s ability to stop bleeding can be contributed to a plant protein that acts like the hormone oxytocin. Oxytocin stimulates contractions of the smooth muscles surrounding blood vessels, especially those in the womb. In addition, Chemical analyses done on the herb have shown that it contains substances able to accelerate the coagulation of the blood. Shepherd’s purse is thought to have a strengthening effect on the uterus and it is considered to stimulate bowel movements, have laxative properties and regulate and invigorate blood circulation. Traditionally, a tea made from the herb has been used as an herbal remedy for a sore throat, and as a natural treatment for urinary tract infection (UTI). Shepherd’s purse is mainly used in Chinese herbal medicine to “cool the blood,” and as a treatment for dysentery, high blood pressure and excessive bleeding after birth. Moreover, it is considered to enhance and improve eyesight and vision. This application could be explained by the high concentrations of potassium and vitamin C in the herb, nutrients that are essential in maintaining a healthy iris. Shepherd’s purse has been used as food for hundreds of years. The leaves can be added to salads or cooked as a vegetable. The seed pods have a “peppery” taste and the seeds have been used as a substitute for mustard seeds. In Japan the herb is an essential ingredient in Nanakusa-Gayu (Seven-Herb Rice Soup) traditionally served on January 7th. The herb can be used fresh or dried and in the form of decoction, extracts, liquid extracts and tinctures. A tea can be prepared by using 1-2 teaspoons of the herb in a cup of hot water and draw for 10-15 minutes. The tea can be drunk 2-4 times a day. Extracts can be taken in doses of one tablespoon 2-3 times per day, and 20 to 30 drops of a tincture in a glass of water can be used 2-3 times daily. For all commercial preparations of the herb, the manufacturer’s instructions should be followed. Although shepherd’s purse has been used for centuries, and there seem to be no reports of serious side effects associated with the use of it in moderate amounts, there are still many unanswered questions regarding its safety. Studies in mice indicate that the herb’s toxicity is small. Perhaps the biggest risk associated with the herb is to rely on it as a sole treatment for serious diseases or ailments but then again the same can be said for nearly all medicinal herbs. Prolonged and excessive menstrual bleeding, uterine bleeding and blood in urine, feces or vomit should always be investigated and examined by a professional healthcare provider. 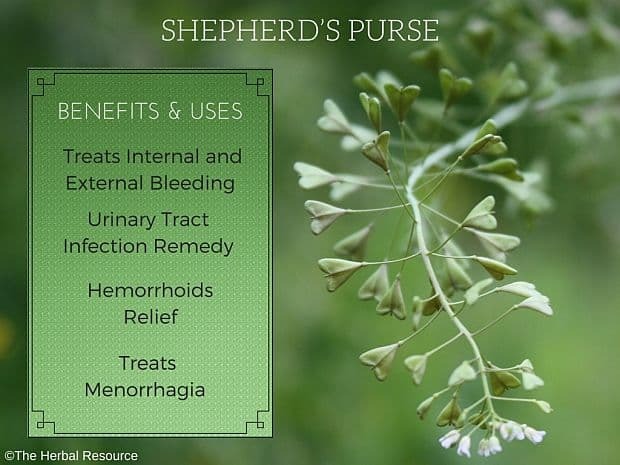 Shepherd’s purse may affect the uterus and in light of that, it should not be used during pregnancy and lactation. People with the tendency to form kidney stones (due to the plant’s content of oxalates) and those that are at risk of heart and lung diseases should exercise caution when using this herb. The herb should not be used with blood pressure lowering drugs, beta blockers, digoxin or sedatives. It should also be noted that shepherd’s purse is often infested by a specific parasitic fungus (Cystopus Candidus) that contains a toxic alkaloid so when the plant is collected it should only be done by choosing completely healthy plants.